Bacon. What more can be said? Too much, apparently. I don’t recall how I found out about John Scalzi’s blog Whatever, but I’m glad I did. Not only did I discover a great science fiction writer, but also a daily source of humor and insight. What is he guilty of? 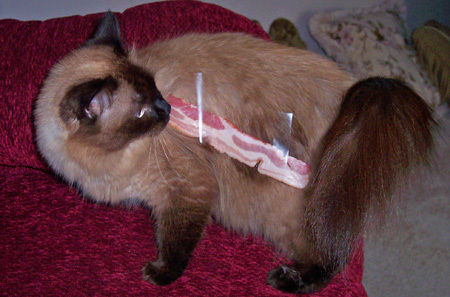 Urm … taping bacon to a cat. So, whenever you think of bacon, or of doing something bizarre with it, let Scalzi know — I’m sure he’d appreciate it. Update (2008-09-13): Introducing The Canonical Bacon Page and The Canonical Bacon Page.